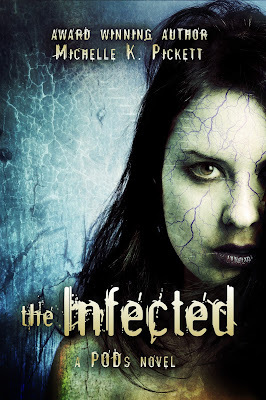 YA Bound Book Tours: Cover Reveal: The Infected (PODs #2) by Michelle K. Pickett! 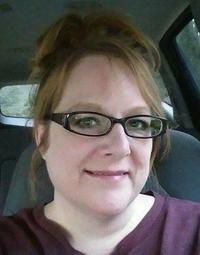 Cover Reveal: The Infected (PODs #2) by Michelle K. Pickett! From the author of the award winning Unspeakable, and the best selling PODs, comes the highly anticipated sequel to PODs. A world where death stalks the unsuspecting, and this time even the PODs might not save them. Months have passed since a human infection has been reported. Survivors of the deadly pandemic have finally started to build a life in a world left devastated by plague. Ironically, for nineteen-year-old Eva, life made more sense when she battled the deadly Infected than it does in the serenity of her new home in Rosewood. Separated from fiancé and former POD-mate, David, after an impossible ultimatum, Eva finds her life a little lonely and a lot confusing. The virus refuses to die quietly. I can’t write without a hoodie. Yeah, I live it Texas. We all have our quirks. I majored in accounting in college. I was required to declare a major, but I had no clue what I wanted to do, so I picked accounting because it was the first thing listed in the booklet the counselor gave me. Surprisingly, I graduated with a 4.0 GPA. Go figure. Forget coffee. Hand over the Red Bull or Monster Khaos and no one gets hurt. Seriously, just set it down and step away. I will turn into a normal human after I guzzle my can of caffeine. I hate to cook, but love to watch cooking shows on television. I paint my nails weird colors just to see my husband roll his eyes and make my 9 year-old twin girls giggle. Oh, and mortify my 13 year-old son. I’m a hopeful romantic and love swoon-worthy endings that keep the butterflies going for days, but I don’t believe a HEA always ends with the boy getting the girl. Sometimes a HEA is an ending we don’t see coming, but is still best for the characters. I write across genres in the young adult and new adult age groups while eating way too many peanut butter M&Ms (but we’ll keep that second part just between us). I was born and raised in Flint, Michigan, but now live in a suburb of Houston, TX with my very supportive family, a 125lb rescue “puppy” and a 12lb attack cat, also a rescue animal. And last, (but certainly not least), I love my family with everything in me. Everything I am, is theirs. There are no words in any language known to man to describe my love for them. They are my center. Cover Reveal: True Born by L.E. Sterling! 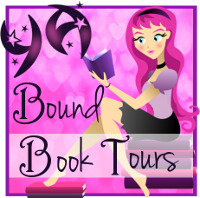 Book Blitz Sign Up: Rarity by D.A. Roach! Cover Reveal: Overwhelm by Layla Messner! Book Blitz Sign Up: Awakening by Catrina Burgess! Book Blitz Sign Up: Taming Tigers by Daisy White! Cover Reveal: Atlantis Quest by Gloria Craw!